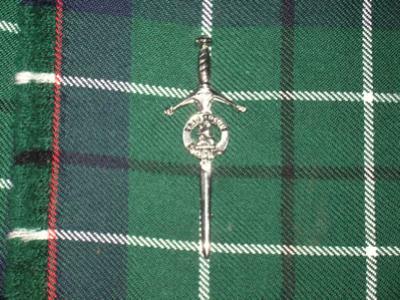 What is a kilt pin, what does it look like, and lastly what is it for? These are all questions that I hear asked quite a lot, and the answers are all fairly straightforward. Some would say that it is no more than costume jewelry, while others say that it is an integral part of the full Highland Dress. My personal opinion is that it is the latter. So what are its origins? Well as with much of the history of the kilt and its accessories, no one can say with any real degree of certainty. It is widely believed that it first made an appearance in the Victorian era. There is an amusing little anecdote which I would like to share with you. During a visit to Balmoral Castle, Queen Victoria's Scottish Residence, she was inspecting a regiment of Scottish soldiers on a particularly windy day (quite normal for Scotland depending on the time of year) when she noticed one soldier struggling to keep his kilt from blowing up, she took a broach from her own clothing and fastened it to the soldiers kilt. It is believed that from then on it became a regular part of the Scottish soldier's Highland Dress. Below you can see what mine looks like. This would then suggest perhaps that the pin's primary function is to fasten both aprons of the kilt together, thereby keeping them closed. But that assumption would be incorrect. It is worn nowadays almost exclusively as a decorative item on the kilt, and should only be fastened through the top apron, and not both. There is a very good reason for this, and that reason is, that by fixing it through both aprons you run the risk of the kilt being torn when you sit down for example. And bearing in mind the cost of a kilt, few people would want to risk damaging it by fastening the pin incorrectly. They are worn on the right hand side of the apron, approximately three or four inches (eight to ten cm) from the bottom of the kilt. They vary in cost and appearance, and are often decorated with clan or family crests, Celtic designs and symbols are also very popular. Many are often made to look like swords or daggers, and vary in size from about two inches up to four and a half to five inches. Below you can see a photo of a pin made to resemble a lightning bolt. You can also buy ones that represent various organizations, for example every branch of the US military has its own. the most widely used is pewter, some people with a bigger budget may choose silver, and for those of you to whom cost is not an issue, you can have gold-plated or solid gold. Regardless of your budget you will have no problem finding one to suit your needs, the choice is huge. 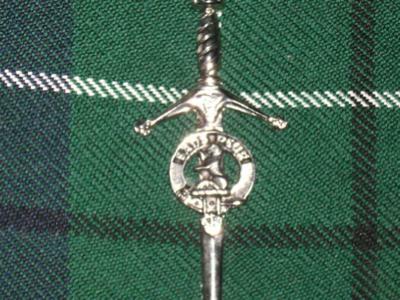 And no matter where you are wearing your kilt, formal or casual the kilt pin should always be worn as it is an integral part of the Highland Dress.